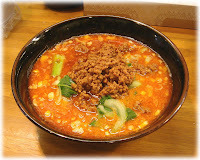 Salarymen are almost invariably a good indication of where the best and cheapest places are to eat, especially for lunch. 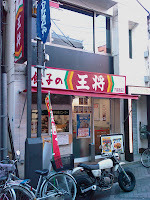 Along the Togoshi Ginza shopping street, just as you go past Tokyu Togoshi Ginza station going west, there is a medium sized shop called Gyoza No Ohsho (= "King of Gyoza"), that had a fair number of salarymen waiting outside around lunchtime yesterday. 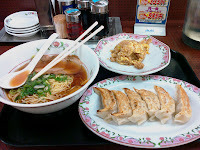 Gyoza No Ohsho is a large nationwide chain of inexpensive Chinese restaurants (including at least 30 branches just in Tokyo and a couple in mainland China). The restaurant chain operates on a principle of providing better food at lower cost than its competitors, and they have a large kitchen and a fairly wide-ranging menu. I would say that the lunch-time set specials are an excellent value. 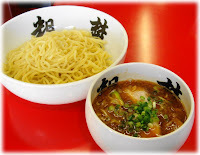 I ordered the Tokyo Ramen lunch set, including a smaller bowl of shoyu ramen with chashu, 6 decent-sized gyoza and some fried rice (chahan). The pork-and-veggie gyoza were amazingly good for 200 yen (what they cost a la carte), and they are hand made by a guy behind the counter in-between his grill cooking duties. 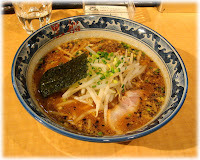 The pork in the ramen was not a bad cut but quite thin, the noodles were premade of course but decent. The chahan had no meat in it and was the size of a large ice cream scoop but for a total of about 860 yen this was a very filling lunch for the price.